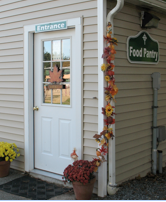 The Food Pantry is open Tuesday evening from 6:30 to 7:30 and Wednesday afternoon from 1:00 to 3:00 and is located at the edge of the back parking lot on the parish campus at 12 Main Street in Pelham. The Food Pantry provides service to people who live in Pelham or are otherwise associated with the town through work or worship. Supported by strong community and parish networks, the Food Pantry provides basic, nonperishable food items, bread, meat, and dairy products on a weekly basis. Personal care items, household supplies and special items are available on a rotating basis according to inventory. The program is overseen by St. Patricks Parish operating under the 501(c) 3 classification of the Diocese of Manchester. The Food Pantry has a 5 member governance team, is staffed by approximately forty volunteers and is protected by the Bill Emerson Good Samaritan Food Donation Act. Donations of food, supplies and money from individuals, families and organizations are received on an on-going basis. Local drives and events during the year help restock many of the Pantry’s supplies. In addition to the food and supplies received through donations, money received is used to purchase meat and dairy products and to supplement high demand items that are packaged for weekly distribution. 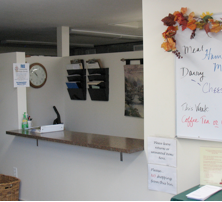 The Food Pantry is also a member agency of the New Hampshire Food Bank, a program of NH Catholic Charities, which enables us to pick up food at no cost or for a nominal fee. If you are a Pelham resident in need of assistance please stop by on Tuesday evenings 6:30-7:30 or Wednesday afternoons 1:00-3:00 p.m. to fill out an application. A valid ID or other proof of residence is required for all household members recorded on the application and those listed must reside in Pelham on a full-time basis. A non-resident may be eligible if current Pelham employment or church attendance can be verified. Upon approval of the application, clients may visit weekly and must adhere to Food Pantry guidelines. Goods: Nonperishable food items, produce, household supplies, and personal care products may be donated at any time. A special area for drop-offs is located at the middle door of the Food Pantry. There are also drop-off areas at the First Congregational Church and Hannaford Supermarket. Please contact Cheryl Brunelle at cdbrunelle@comcast.net or 603 635 3610 if you have perishable items such as meat or dairy products to donate. We cannot accept toys, clothing, books, appliances, furniture or house-wares. Money: Cash donations can be brought to the St.Patricks Parish office at 12 Main Street Pelham NH 03076 or to the Food Pantry when staff is present. Please do not mail cash. Checks may be made payable to the Food Pantry of Pelham at St. Patricks Parish and can be mailed or brought to the Food Pantry or St.Patricks Parish office at 12 Main Street Pelham NH 03076. Electronic Giving: To use a credit card or bank transfer, click on the Online Giving icon to create an account and choose your giving options. Online Electronic Giving is very safe. Your personal information is kept secure by Vanco Services, LLC – an established and highly regarded company that serves more than 11,000 churches and non-profit organizations. You may close this account at any time. Food Pantry: 603 635 7592 Tuesday 6:30 – 7:30 p.m. & Wednesday 1:00 – 3:00 p.m. The generosity and goodwill of the community at large is vital to our mission to serve Pelham residents who are struggling with financial instability or experiencing food insecurity. Our success is truly dependent upon the involvement, backing and help of those around us. Thank you for your support; it is greatly appreciated.